* The DNR has proposed removing the trout stream designation from several trout streams and trout stream tributaries. In some cases, waters no longer designated as trout streams or trout stream tributaries would no longer meet the definition of a public water and, therefore, would no longer require a buffer under state law. 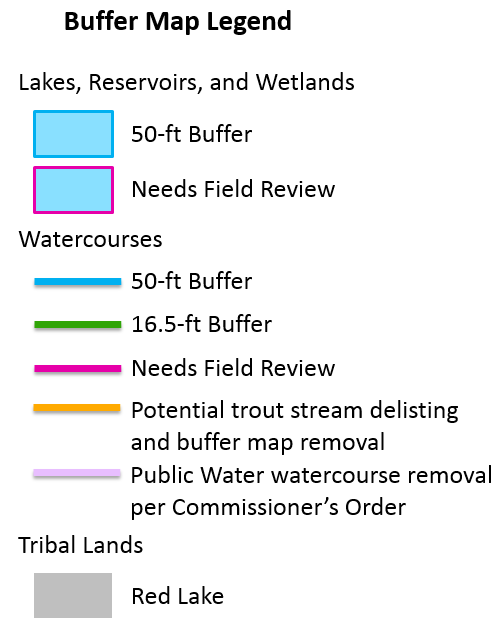 This buffer map update highlights the streams that would not require a buffer if the trout stream designation is removed. Landowners are not required to implement buffers on the highlighted streams until the DNR makes a final decision on the trout stream designation changes. This application shows the statewide Buffer Protection Map. It represents the minimum state buffer standards in the buffer law (MN Statute 103F.48). Landowners must also comply with local ordinances, which may be more restrictive than the buffer law. The map is intended to help users locate waters that require buffers, based on Minnesota's buffer law. It does not replace on-the-ground verification and delineation of buffer locations. The State does not have the legal authority to enforce the requirement of Minn. Stat. § 103F.48 on tribal land holdings. For purposes of the buffer certification program, tribal land holdings means all tribal land located within the boundaries of a federally recognized Indian Reservation and all lands held in trust by the federal government on behalf of a federally recognized Indian Band. Other exemptions to the buffer law are not displayed on this map. The map was created from two sources of data: the Public Waters Inventory (PWI) and a public ditch layer created from data provided by local drainage authorities. This map does not replace the PWI maps. Every reasonable effort has been made to ensure the accuracy of the data on which this map is based. However, the Department of Natural Resources does not warrant the accuracy, completeness, or any implied uses of these data. This map was compiled and generated using geographic information systems (GIS) technology. GIS data products are available from the MN Geospatial Commons. Public waters that were mapped as requiring a 50-ft. (avg.) buffer at the time the buffer law was passed will not be re-mapped if they subsequently become part of a public drainage system. The map will continue to show them as requiring a 50-ft. (avg.) buffer. This map is subject to change as of the date listed and will be periodically updated. If you believe the buffer map is incorrect, please work with your local Soil and Water Conservation District to clarify the issue and direct your concern to the appropriate person for resolution.